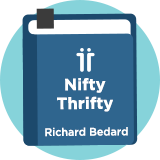 Richard Beddard Nifty Thrifty is an investing strategy based on the approach of UK investor and journalist, Richard Beddard of Interactive Investor. It combines quality and value factors using Joel Greenblatt's Magic Formula and Joseph Piotroski's F-Score. The Magic Formula ranks stocks for value and quality using the earnings yield and return on capital as its key metrics. The F-Score is a 9-point checklist of financial health, of which stocks qualifying for this strategy must pass at least 5. Beddard said: "I don't really see how you can be an investor if you're not trying to understand businesses; how they make money, and what makes them go bust." Between June 2010 and December 2014, Beddard's own Nifty Thrifty portfolio had returned 47%. Renowned UK Finance Blogger for Interactive Investor.